If you are looking for cosplay costumes for the Florida Supercon, visit Wonder Costumes. Miami’s most trusted costume store has theatrical quality character outfits that will make you a proud cosplayer at the city’s biggest comic convention. As a true comic book and anime connoisseur, you do not settle for the average Halloween costume made for a one day trick-or-treat appearance. You want quality and uniqueness; these are the properties that separate the ordinary from the epic. Comic book fandom is more than a hobby, it is a lifestyle. Celebrating the—often life changing—characters and plots of movies, comic books, video games and cult classic animations is more than just a one-time affair with a cheap costume. Cosplay is a way of showing appreciation for the meaningful characters that inspire you. Only a high quality costume combined with your ideas, ingenuity and knowledge can do those captivating personalities justice. Your celebration starts at Wonder Costumes! Wonder Costumes has been serving the cosplay scene since 2005 through our online store, WonderCostumes.com. We were exclusively available online serving the world—and we still are—but in 2006, we started receiving inquiries from local costumers looking for original character clothing from rare films and exclusive graphic novels that could only be found online. We just so happened to be one of those online stores that have it all, and we are located in Miami. Wonder Costumes immediately opened the doors to the local public to better serve South Florida’s awesome geek culture. This was good news for our local fanboys and girls—delivered just at the right time when the Florida Supercon was first held in 2006 in Hollywood, FL. 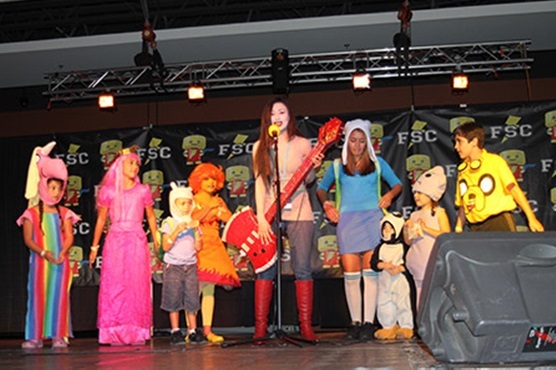 Before the FSC moved South to become the household name for cosplay costumes in Miami Beach, we knew Something big was in the works! It only took a few years for the Florida Supercon to become one of the most attended comic conventions in the Southwest; and in parallel, Wonder Costumes grew at an exponential rate through our online business and the support of our local cosplayer community. Not surprisingly, we were able to keep up with the local cosplay scene thanks to the increasing attendance at the Florida Supercon. Since the humble beginnings of our business, we have made sure to keep full stock of the most sought after anime and cosplay costumes for comic conventions. Our wide collection includes classic theater quality outfits from ultra-popular movies like Star Wars and Lord of the Rings as well, as more specific niche anime costumes like Drangon Ball Z and Sailor Moon. Superhero costumes from every corner of the DC and Marvel Universe—and even the alternate universes—make their way into our store every year before the Supercon comes in July. We are fully prepared to meet the demands of the Supercon cosplay community. Our history and relationship with Miami cosplayers has come a long way. In 2015, Wonder Costumes set up shop at the Miami Beach convention center to become one of the proud vendors at the Florida Supercon. Being in the flesh at the center of the action helped our company interact with our customers in a more intimate way. The very public that we have been serving for years now sees us a peers. Being there helped us appreciate and understand the needs of the Miami cosplay culture. That is why every year after, Wonder Costumes will be able to bring you exact products that you seek to enhance your creative process of dressing up like a professional cosplayer. If you are in Miami—or anywhere in South Florida—and you are seeking help with ideas for rare cosplay costumes and accessories to bring your favorite comic book and anime characters to life, contact us locally at 305-253-5380 or via e-mail at info@wondercostumes.com.